The past few weeks I have regularly been in a position to eat as many blueberries as I want. Believe me, this is a quite the dangerous situation. I had my last official day in the blueberry patch on Thursday and I frantically ate at least a quart of berries in the thirty minutes I was given to “pick for cart”. It’s feast or famine, people. 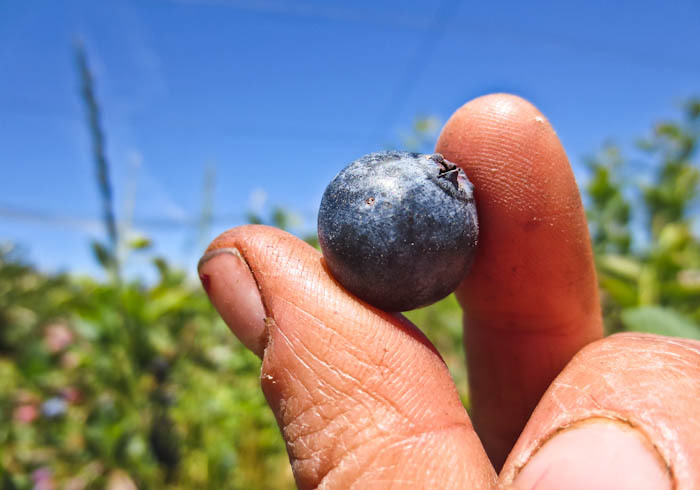 Blueberries are a big cash crop for the Farm, grossing about $10,000 annually between wholesale markets (campus dining services and local grocery stores) and direct sales (Farm cart and the CSA) from just a quarter acre of plants. Blueberries are also completely irresistible, and even your most law-abiding citizen is not to be trusted near a bush dripping with ripe berries. For that reason, the whole patch is enclosed by bird netting with the front door under lock and key. 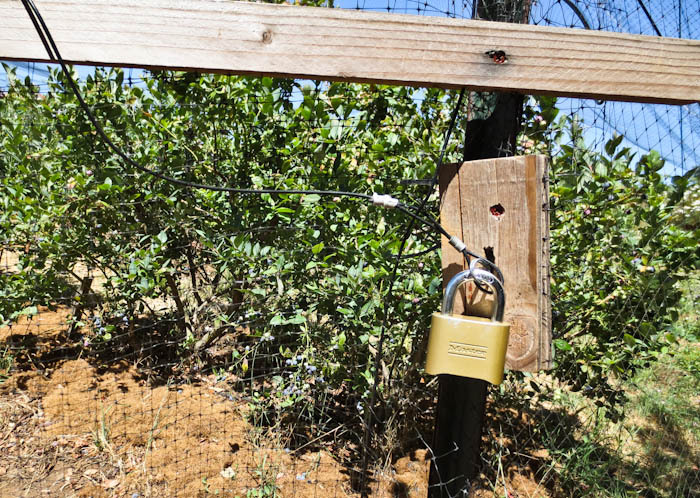 This tactic (somewhat) successfully keeps out winged and land-bound intruders. Though few determined birds find their way in every week, to gorge themselves in the land of endless blueberry delight. 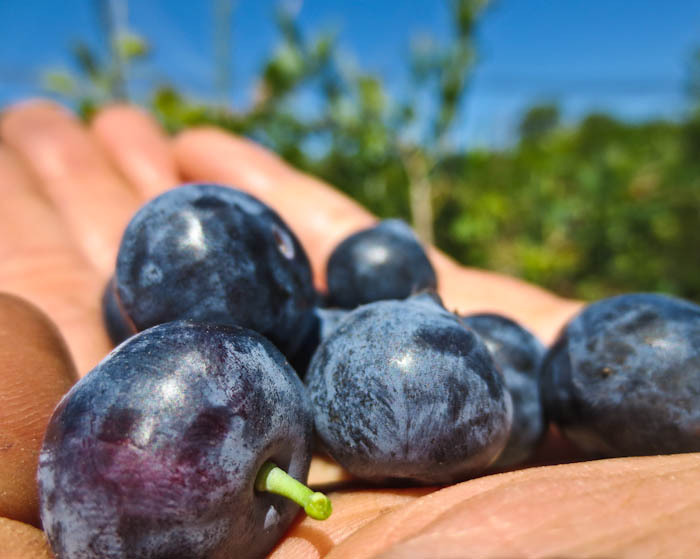 Blueberries naturally grow in and on the edges of forest ecosystems and require soils significantly more acid than those found on the farm. To address the pH issue an automated system mixes concentrated vinegar with municipal water and delivers the cocktail to the plants through the standard irrigation lines in the blueberry patch. 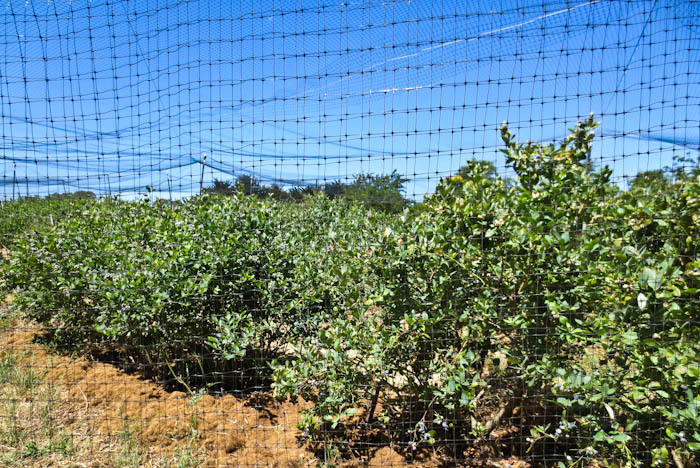 The blueberries were planted in 2004 as an experimental plot to determine which varieties performed the best in the Santa Cruz climate. 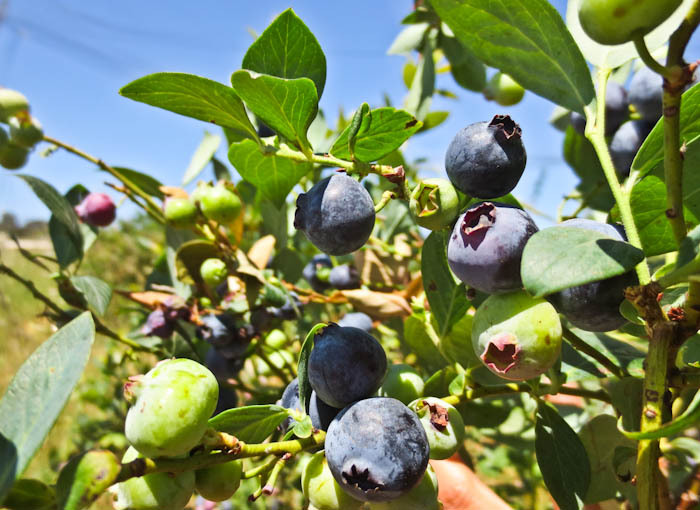 Fourteen different blueberries varieties were trialled, and Southmoon, O’Neal, Sapphire and Santa Fe have apparently stood out the most for hardiness and flavor. 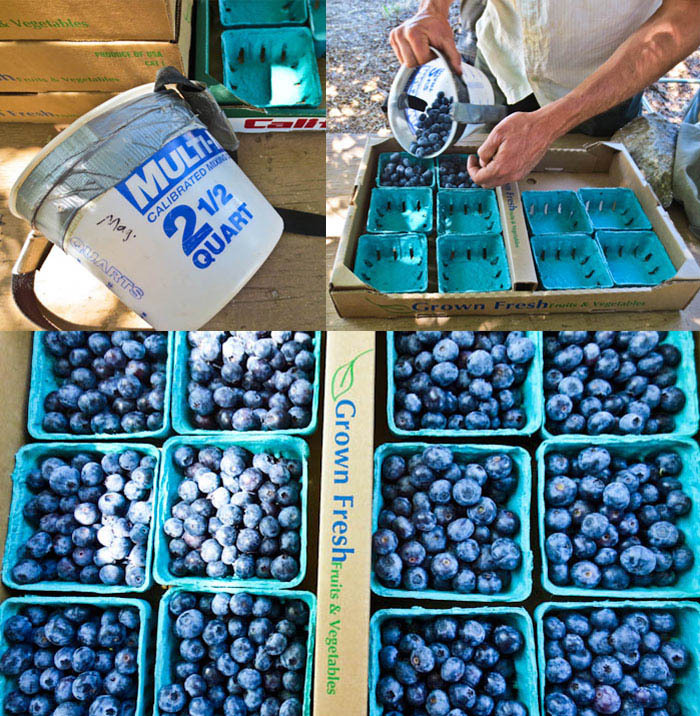 We pick the blueberries by hand. The ripest berries come loose easily when touched, so you hardly have to look where you are picking. On the most productive plants you can grab handfuls of berries and drop them with a satisfying “plunk-plunk” into a plastic picking bucket worn round the neck. Two and a half quarts of sun-warmed blueberries hanging heavy on your neck feels like quite the accomplishment. We package the berries in flats of half-pint containers by hand, pouring in one layer at a time to quickly sort out the under/over-ripe berries. Ah blueberries, so very beautiful. The season is short and I’m determined to make myself sick of blueberries by the end of it. I want to eat blueberries all the ways. Cobbler! Pancakes! Pie! And of course, by the handful. Heliotropism is the movement of plant parts throughout the day with the direction of the sun. Working in the greenhouse for the past month has made me particularly aware of this slow motion plant dance. The sunflower babies pictured below twist their whole bodies as their leaves follow the sun from east to west everyday. My father reminded me of a William Blake poem about heliotropism: Ah, Sunflower. Welcome to inaugural installment of Know Your Cover Crop! Cover crops are essentially non-cash crops planted to nourish and insulate the soil. During their growth cover crops protect the soil from being swept away by wind or rain or baked to a crisp by UV rays. Their roots retain moisture and aerate the soil, allowing habitat for all kinds of critters, subterranean and otherwise. When cover is mowed down and worked into the ground the plant material provides a boost of nutrition for future crops and forms soil structure. So in a nutshell, cover crops are incredible soil builders and might just be the answer to all your problems, including hair loss and missing kittens. Let’s take a closer look. First up, the Bell Bean, Vicia faba. Bell beans are a species of vetch, though their sturdy stalks and upright growth are very different from the wispy, creeping tendrils of other vetches. Bell beans are also a little more finicky than other vetches: less frost hardy, less drought tolerant, less content with being waterlogged. 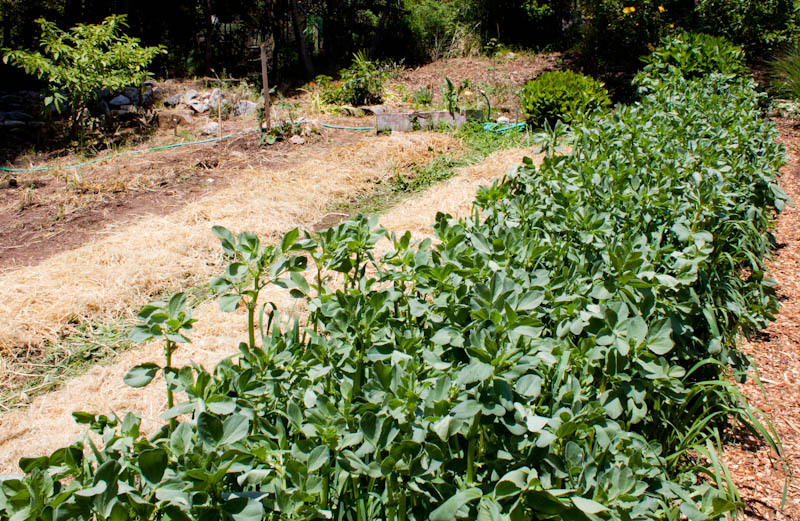 However, bell beans do not produce hard seed as rapidly as other vetches, allowing them to be incorporated into the soil without fear of the seeds sprouting and taking over. 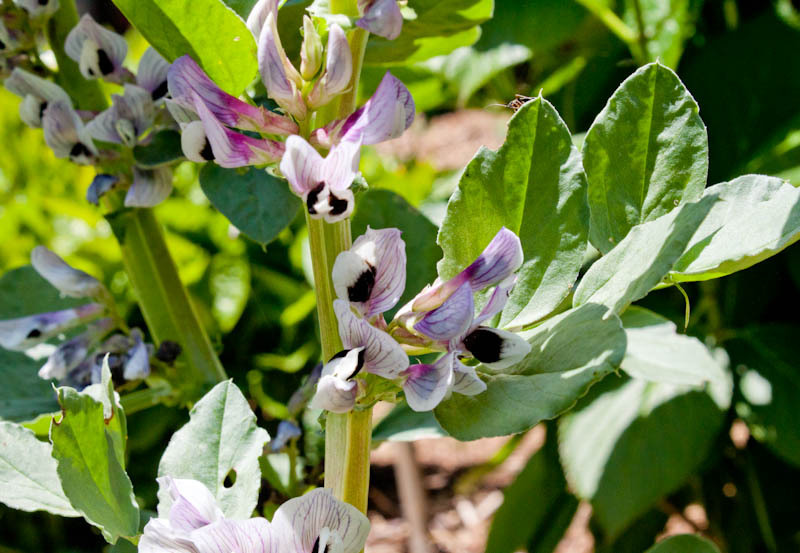 Bell beans are a leguminous cover crop, producing nitrogen-fixing nodules during their growth. These nodules take nitrogen from the atmosphere and feed that nitrogen back into the soil in plant available form. 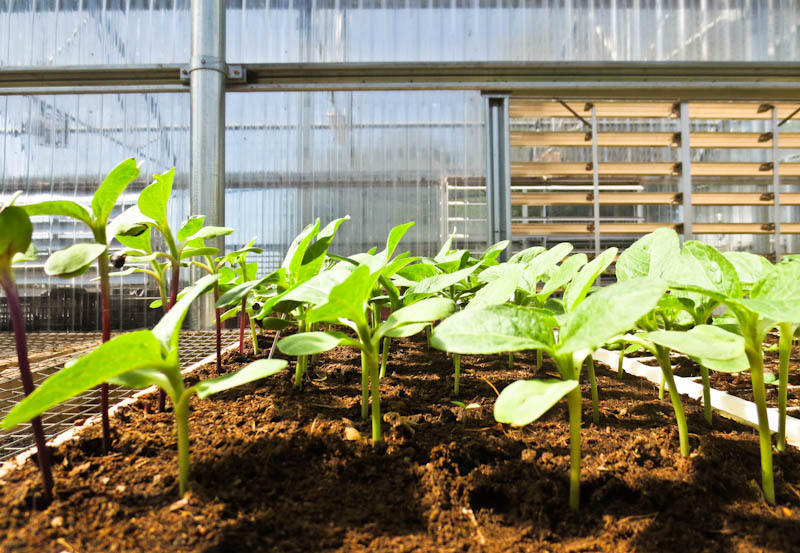 So the bell bean is a living fertilizer factory, boosting soil fertility even before the cover crop is turned into the soil as organic matter. 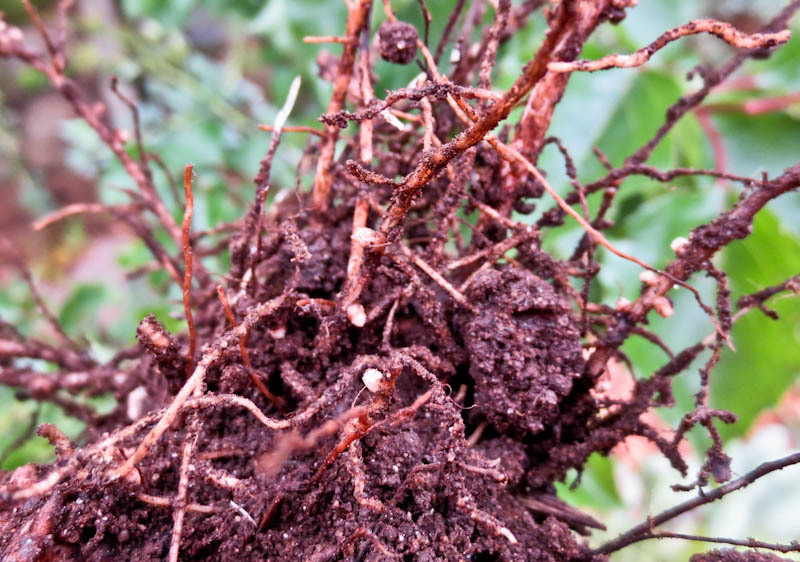 Bell bean roots form these nodules by associating with rhiobium bacteria found in the soil. You can actually buy arhizobium bacteria inoculant to apply to the bell bean seeds before planting to ensure the best nodulation. In the picture above you can see the little nodules on the bell bean’s roots. If you were to cut open one of those nodule’s you’d see a pink or redish material, an indicator that nitrogen is being fixed. The color is caused by leghemoglobin (similar to hemoglobin in blood) that controls oxygen flow to the bacteria. Science! 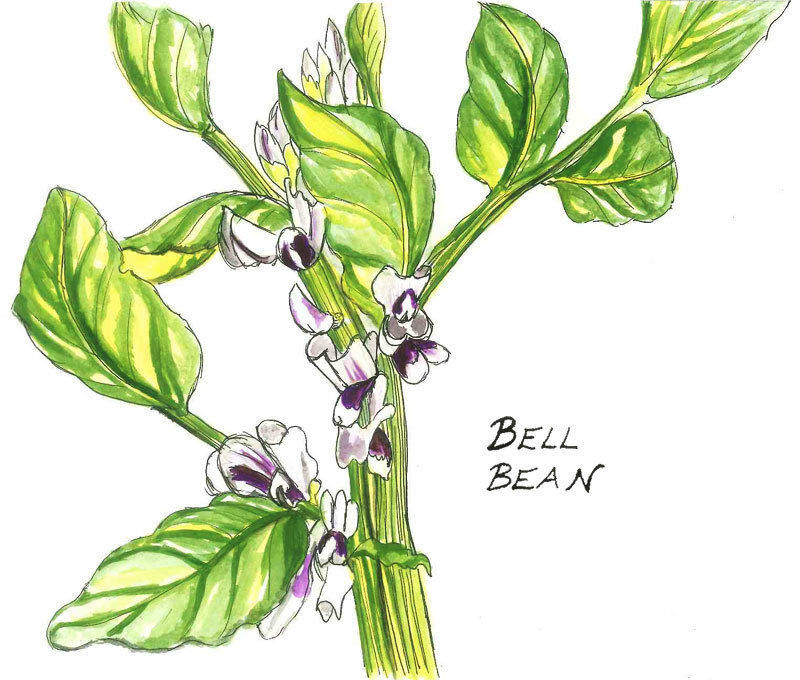 Bell beans are prone to pea-bean aphid attack. This doesn’t particularly effect its usefulness as a covercrop, but can hinder the plant’s ability to produce savable seed. 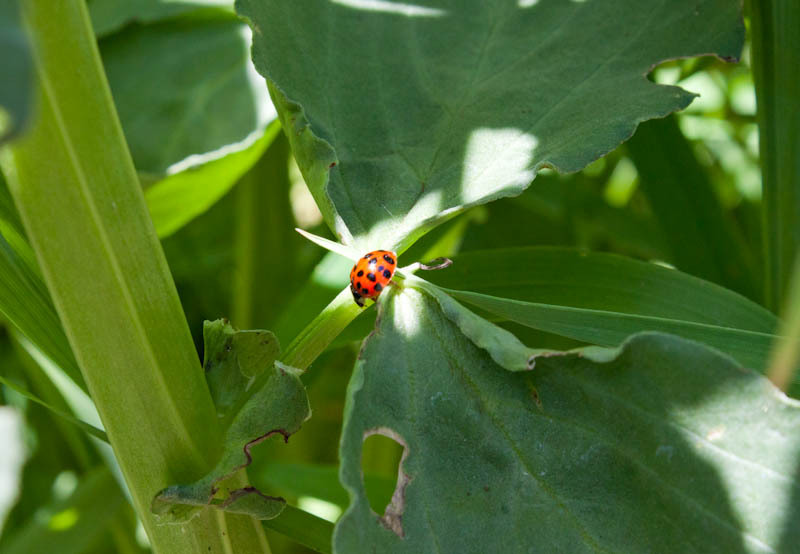 The aphids provide food for other critters, such as this happy ladybug. Actually bell beans are excellent habitat for all kinds of insects. Extrafloral nectaries (sources of sweet, sticky nectar found on the non-flower plant parts) on the bell beans lure in ants and other insects. On the bell bean nectaries are found on the lower part of the stipule, which is a little gland at the base of the leafstalk. Bell beans are used on the farm as a winter cover, typically in combination with oats and other vetches. My understanding is that bell beans are the same thing as fava beans, except that the variety used for cover crop develops smaller seeds than the culinary fava. Seeds planted in the late Fall in Santa Cruz and then incorporated in the soil in April and May. When we first arrived there were bell beans are far as the eye could see, but now they’ve all been turned into the soil, feeding the beautiful spring crops just starting to mature in the gardens. After two months, the little pepper I planted in a no-dig container is doing great! I should have never doubted the Australians. Despite being tucked away on my friends’ back patio which doesn’t get great light, its grown super fast and even has some little blossoms. Who knows, maybe I’ll get to eat a real homegrown capsicum before I head back to the land of bell peppers. A few weeks back was time for tomato planting in New South Wales. Heading into mid-November, the danger of frost had just passed and this southern-hemisphere Spring was finally warming up. Since my track record raising tomatoes is pretty shoddy, I was excited to get some tips from the Milkwood market gardener Michael Hewins. The Milkwood crew started their tomatoes from seed back in September- below is a picture of the little beauties all laid out, ready for planting. First step is to trim off the lower leaves of the plant as close to the stem as possible. If you are doing a large scale planting, it is important to sterilize the knife or scissors you are using with alcohol as you go, since it is possible to transfer diseases from plant to plant. 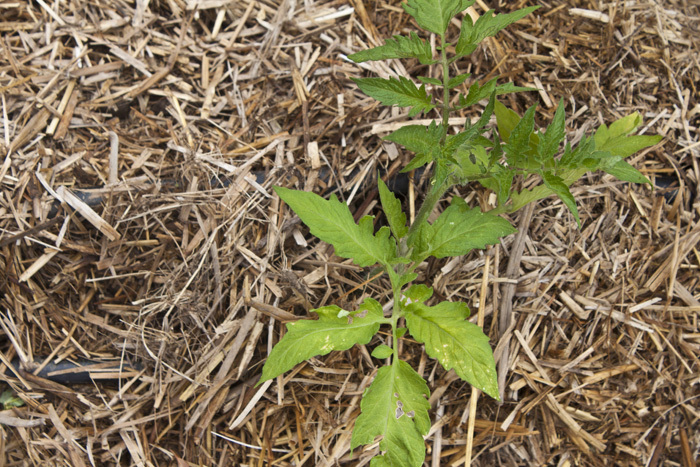 The lower leaves of the tomato are cut off in order to bury the plant into the ground all the way to its upper leaves. 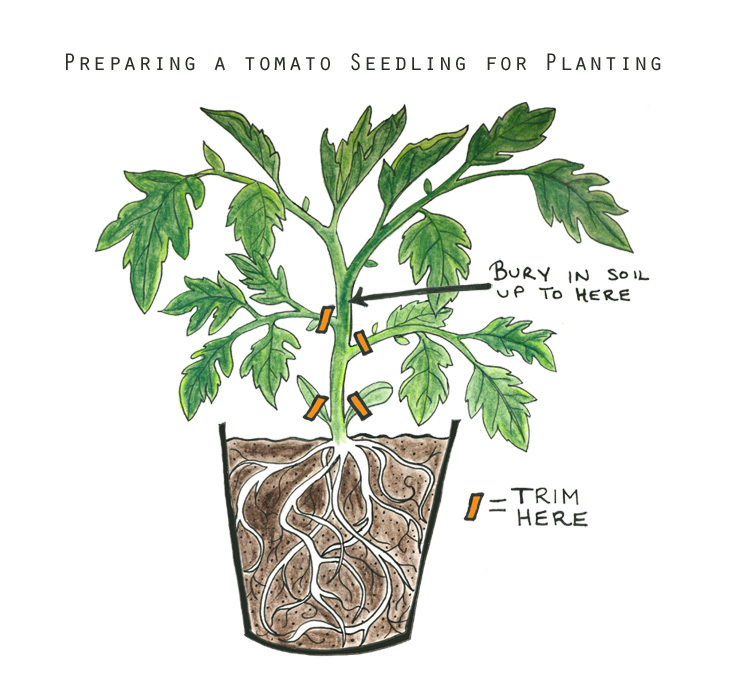 Once underground, the stem of the tomato will grow roots, creating a sturdier plant. 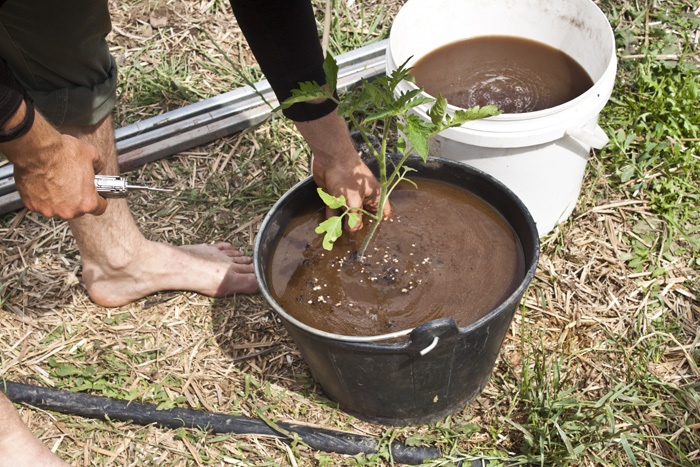 Before planting, Michael submerges the lower half of the potted seedling in a mixture of fish emulsion + sea kelp diluted with water. This gives the seedling a surge of nutrients to help it overcome the shock of transplanting. Hold the pot under the liquid until all bubbles have come to the surface, guaranteeing that the roots are fully saturated. 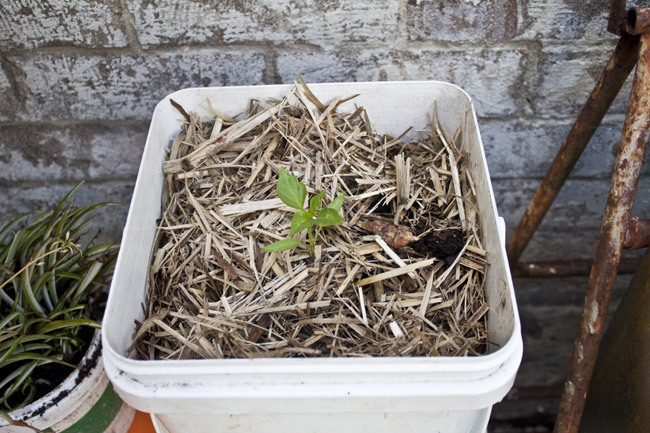 Tomatoes are vigorous seedlings and their little roots will often be pressed up against the side of the pot by the time they’re ready to transplant. 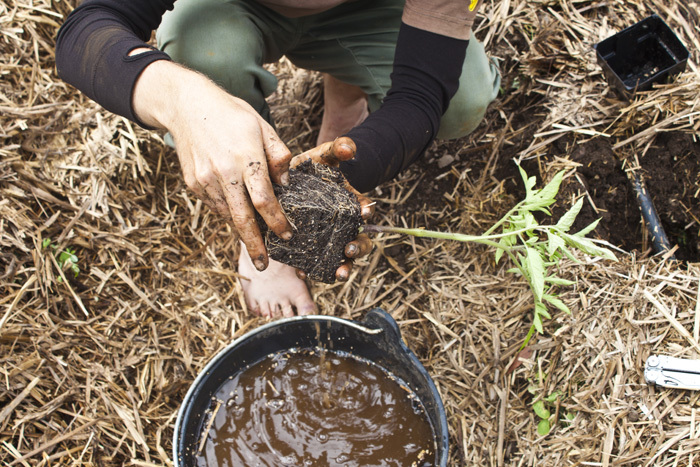 Gently loosen the bottom of the root ball to encourage the roots to grow out into their new home. Here is a (mostly) happy tomato seedling! Sometimes the leaves discolor slightly as the plants get over transplant shock. The bed was prepared by incorporating cow manure and compost into the soil, providing a good dose of nutrients to get the seedlings growing. After just a few weeks these tiny tomato plants have doubled in size, and soon it’ll be time to prune and trellis. More details on that shortly! I’m currently in Sydney, visiting some friends before starting up work at Milkwood Permaculture in a week! The day after I got here I went to a great beginners gardening workshop put on for free by the Green Living Center. 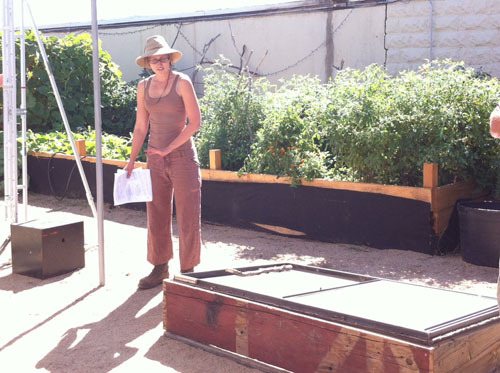 The workshop taught participants how to build up a little container garden using the principles of no-dig gardening. 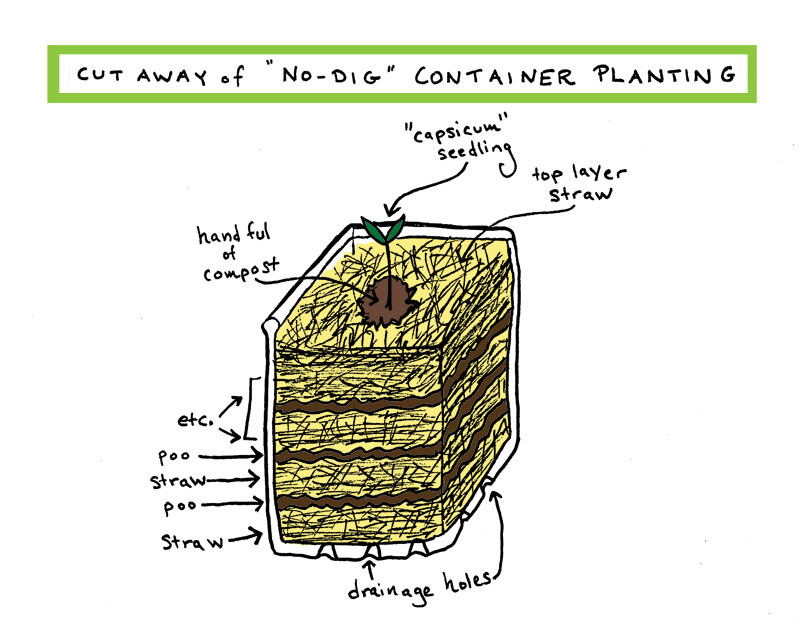 I’ve used the no-dig layering method in raised beds before, and to be honest I’m a little skeptical that it will work as well in a container. But I made one up at the workshop for the back patio of my dear friends Jonny and Suzi, and we’ll just see how its looking in a few months. 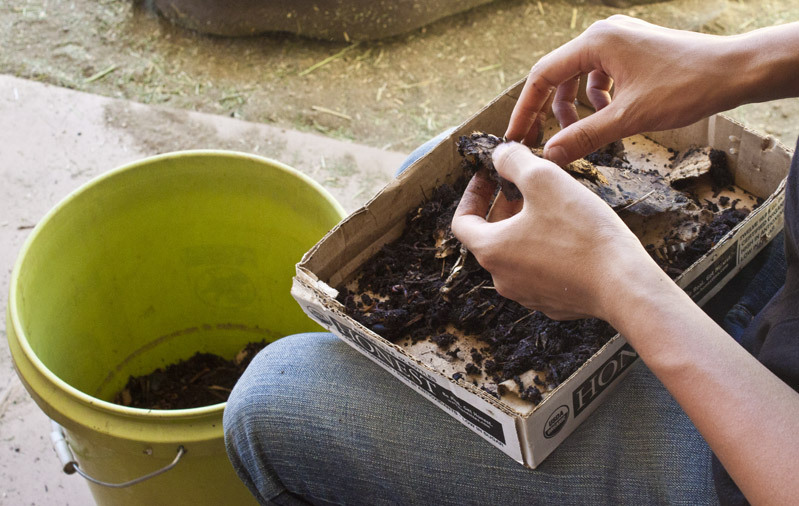 The basic principle of no-dig is that you are creating soil by layering compost pile materials (straw, manure, grass clippings, leaves) and planting directly into this lasagna. The layers should slowly break down into “soil” over the course of the season. Below is a diagram of how this principle translates into a container. We used cane sugar straw, which I’d never heard of before, and various kinds of manure (chicken, sheep, cow) for the layering. 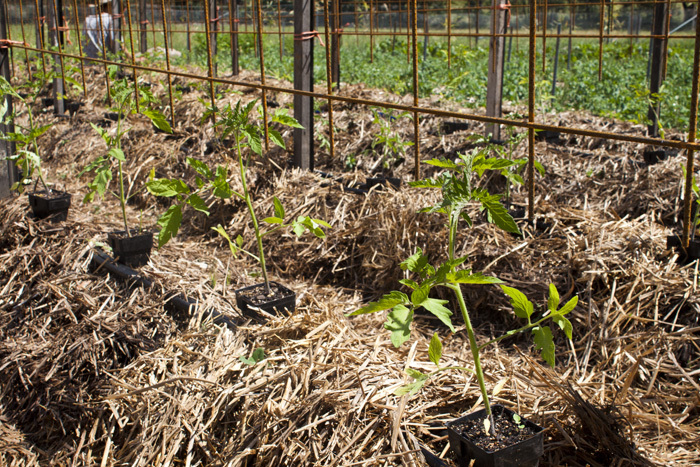 A handful of compost was placed in the center, and a capsicum (sweet pepper) planted directly into the compost. 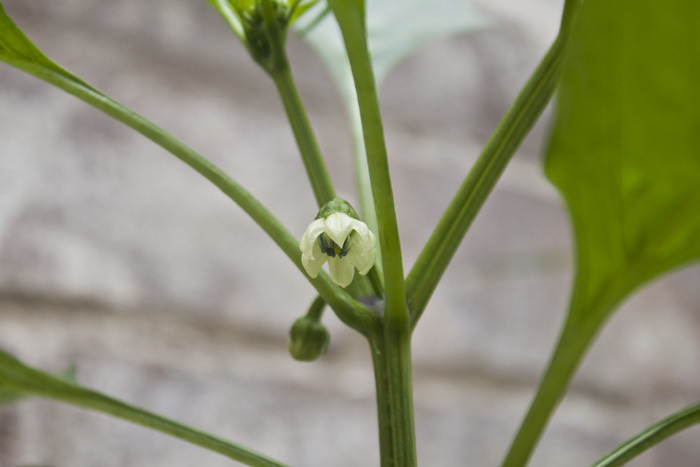 Go capsicum go! Growing food in Los Angeles, I haven’t had much need to experiment with cold frames. However up in the Owens Valley where I interned this summer there was much excitement about extending the season into the freezing winter. Chard on ice! Spinach in the snow! The Four Season Harvest by Eliot Coleman was making the rounds, which is full of inspiring and easy ways to winterize your crops. 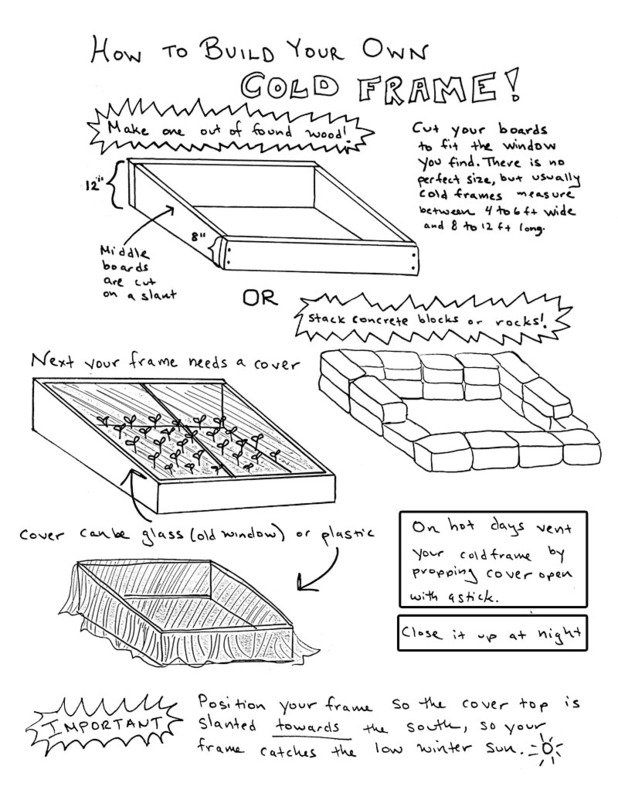 In mid-September, with winter looming near, I thought it would be a good time for a ‘build your own cold frame workshop’. All wood for the project was scrounged from the Lone Pine town dump and a window was foraged, making the total cost of this project under $5, just for screws. Below is a copy of the handout I made for the workshop, you can download the full-size pdf here. The workshop was pretty well attended, and I can’t wait to see those cold frames in use when I come back for a visit in January! I know, exciting stuff. 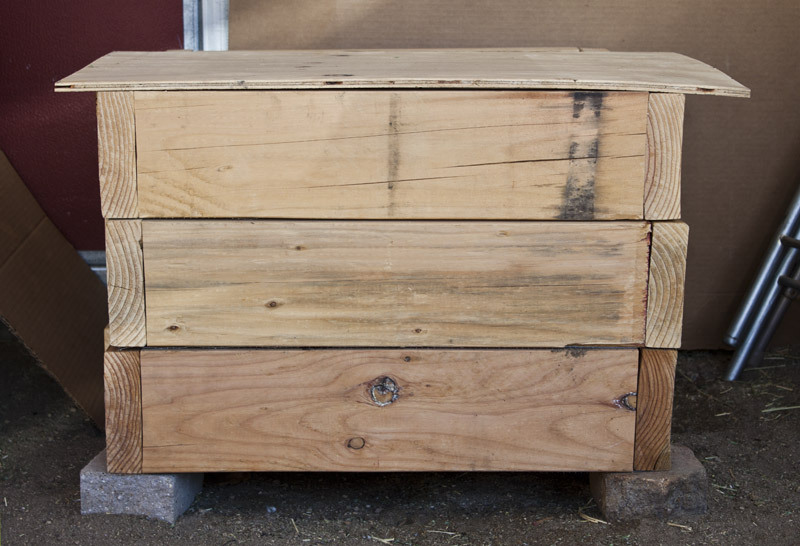 The ranch where I am currently interning had two, well-functioning worm bins when I came on board a few months back. 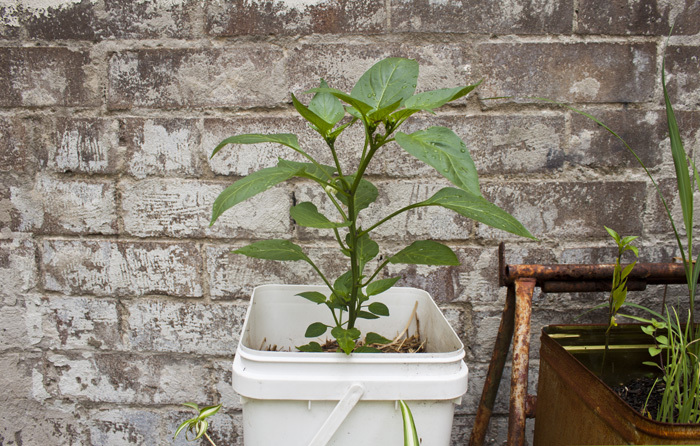 So well-functioning, that it soon came time for one worm bin to be harvested for castings, and its wriggly residents separated into two separate bins. That meant a third worm bin was needed, and my boss Julie let me experiment with a new design. But first let’s talk about some harvesting techniques. 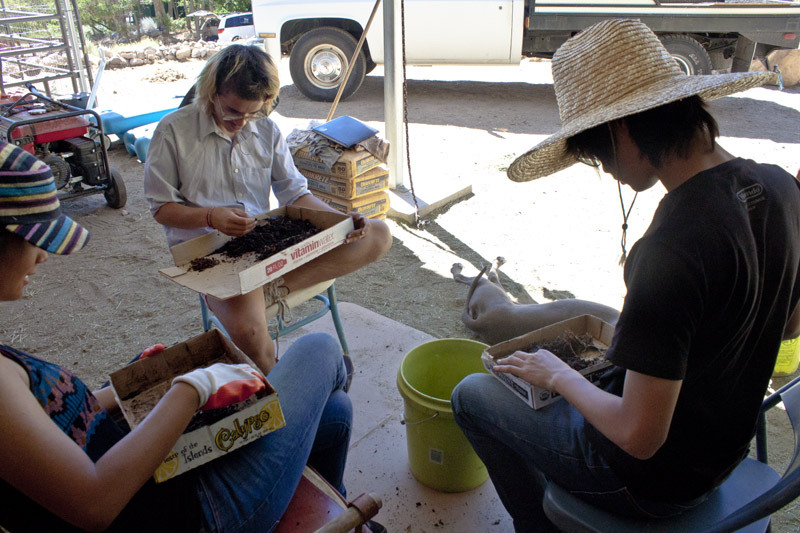 Marcos Trinidad of Audubon Yes brought up a great group of teenagers from the Los Angeles area to help us out with soil building projects on the Ranch. Some of the kids got really into the worms, and we had a consistent team of four working on the harvesting. Julie’s technique for harvesting is slightly different from ones I’d seen in the past. She instructed us to take a big handful of compost, put it in a shallow cardboard box and pick the worms out from the casting material. 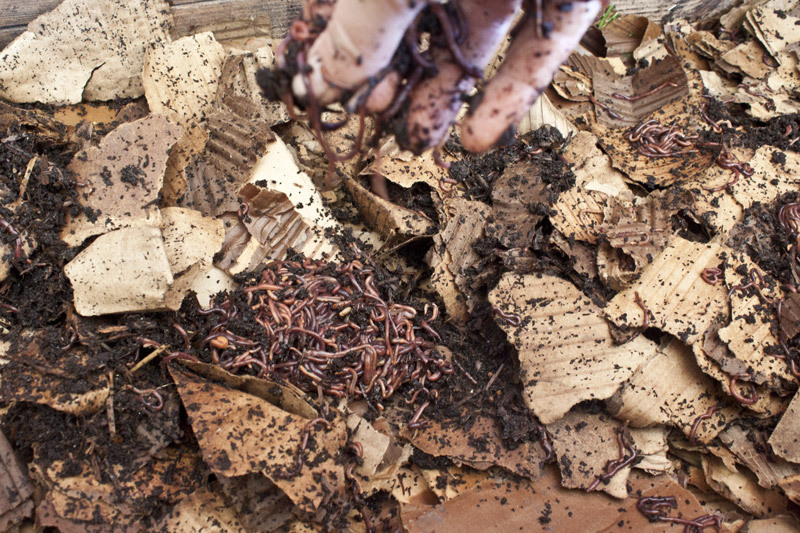 You toss the rescued worms into a bucket, and dump the remaining material onto a screen of 1/4 inch hardware cloth for sifting. The fluffy, rich castings that fall through the screen get laid out on plywood sheets to dry. Once dry enough to not go anaerobic during storage, the castings are kept in a 5 gallon bucket. 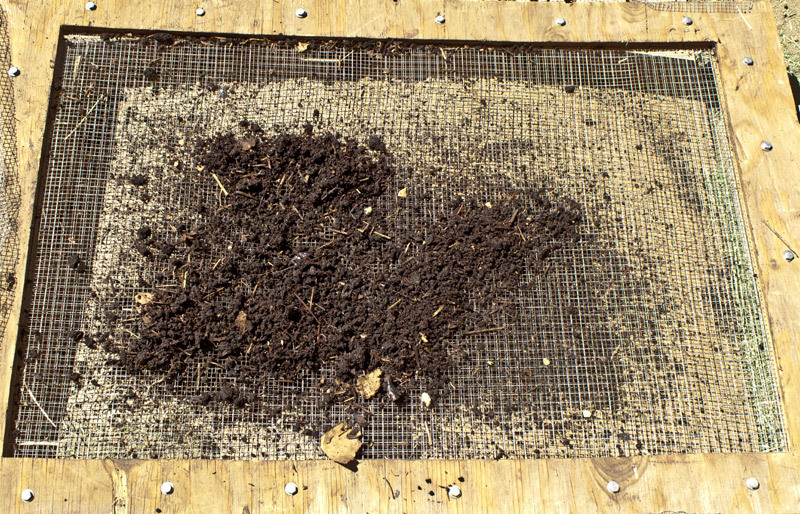 The chunks of food and bedding that stay on the top of the screen go back into the original bin for more processing. While painstakingly slow, the method was certainly effective. We ended up with approximately seven pounds of worms and five pounds of dried worm castings. It took me plus four somewhat enthused teenagers about six hours total to get through the whole bin. Without their help, it would have been quite the challenge. Now for the fancy new worm bin. I built up a wooden stackable design that I found in the book Compost Tea Making. I was intrigued because I’d only ever seen plastic, store-bought stackable bins. 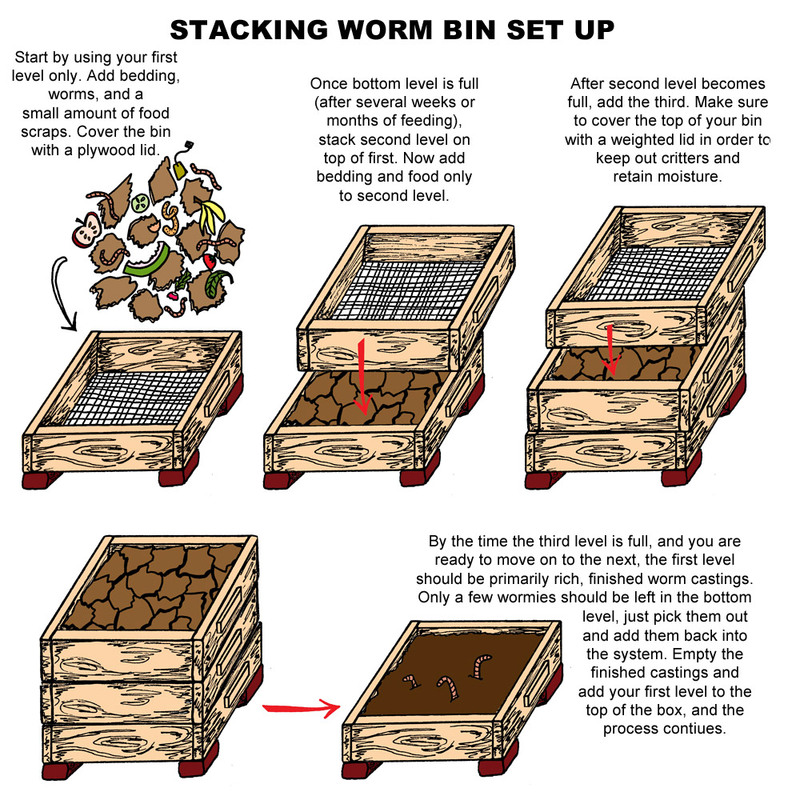 The basic principle behind stacking bins is to ease harvesting by separating finished castings from material that is still being processed by the worms. Below is a diagram of how this snazzy new bin SHOULD work. Each level of the bin is essentially a two foot square frame made out of 2x6s. 1/4 inch hardware cloth is secured to the bottom of each frame with roofing nails to keep the levels separate. Handles are made out of strips of 1×2 wood. A square, removeable lid was made out of 1/2 inch plywood. You could easily make this design out of repurposed wood. I was in a hurry so I bought most of the wood last minute from the lumber yard. 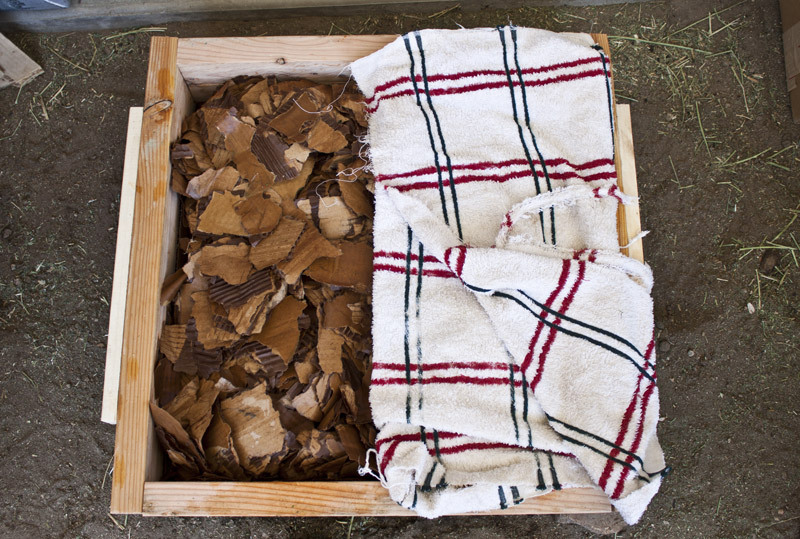 The bedding material we use at the Ranch is well-soaked, shredded cardboard. There is no paper recycling in town, so cardboard is a plentiful waste product. I packed the whole first level with wet cardboard and put three pounds of red wrigglers in the bin. I only gave them one pound of food at first, since I knew it would take them a little bit of time to adjust to their new environment. The desert environment I’m living in currently is extremely dry, which is a serious concern for a worm bin. To preserve moisture in the bin, I cover the bedding with a thick, wet towel. Whenever the towel dries out, I just take it off and resoak it, keeping the bedding underneath nice and moist. I also rest the first bin level on a piece of plywood, so the hardware cloth bottom doesn’t allow too much moisture to escape. A secure plywood lid is key as well. Now having used the bin for a few weeks, I suspect this design would be better to use in a milder climate, but I’m still hopeful it will work sufficiently well here in the Owens Valley. I’m really excited to see if the new bin speeds up the harvesting process, since I certainly can’t count on having a bunch of worm-loving teenagers around next time.